Fox confirms Gotham will be an origin story for the young Bruce Wayne and will be in the same gritty tone as Christoper Nolan's Batman films. Last year, Fox announced that it has given a straight-to-series order for a new live-action TV series titled "Gotham," which reportedly wouldn't feature Batman himself, but instead focus on a young Commissioner Gordon. But at today's TCA (Television Critics Association) press tour, FOX Chairman of Entertainment Kevin Reilly has confirmed the earlier reports were false, and that the show would indeed function as an origin story for the Dark Knight. According to Reilly, Gotham "is an origin story for the young Bruce Wayne," and promises that all of the classic Batman characters and villains will make an appearance on the show, which includes Commissioner Gordon, the Penguin, the Riddler and of course, Batman's arch-nemesis, the Joker. The TV series will show how the characters "became who they are," and be about "Gotham on the brink." 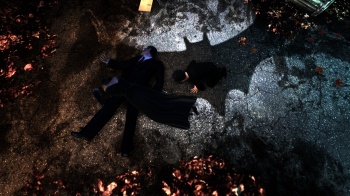 As for Bruce Wayne himself, the show will follow him from childhood through his transformation into the Batman, with the final episode highlighting the moment when Bruce dons the cape and cowl. While FOX is still uncertain what age he'll be when the show starts, Reilly estimates that Bruce will at least be 13 at the start of the series. "If we do our job well he'll be a young man and be ready (to be Batman) by the end," the exec adds. This slow reveal rings true for Batman's foes, too, as Reilly mentions, "We're not starting in that world where the villains are in costume," but viewers will witness the villains' transformation, and how they end up as the characters we know now. Just in case you're wondering, the Gotham TV series will share no connection to Zack Snyder's Batman vs. Superman film. So, don't expect a Ben Affleck cameo anytime soon -- though that's not to say it won't borrow anything from past Batman films; while director Christopher Nolan is not involved with the show's production, it will be in the same grittier tone established with the Dark Knight trilogy. Casting for Gotham is expected to start soon, but no target premiere date has been announced as of press time. Based on what we know so far, what do you think of this new take on Batman's origin story? Will FOX be able to replicate the same level of success as Batman Begins or even Frank Miller's excellent Batman: Year One graphic novel?